The Application Period for the Registered Nursing Program is January 15 through March 1 for the following Fall and Spring semesters. See the Annual Academic Application Cycle. Students Admitted for 2018-2019 Registered Nursing Program. The Ohlone College Registered Nursing Program utilizes a combination of Multi-criteria Screening Selection Process and random selection (lottery) for admissions. Learn more about the one of the pre-nursing orientation meetings. All prospective applicants/students in the Registered Nursing Program must attend a Mandatory Pre-nursing Orientation. Please carefully read about the new Annual Academic Application Cycle! All persons wanting to apply or reapply to the Ohlone College Registered Nursing Program must attend one of the mandatory Pre-Nursing Orientation Sessions. Friday, February 8, 2019, 10 am to 12 pm. All Mandatory Pre-Nursing Orientation sessions are held in Rooms NC2100, NC2102, NC2106, second floor, Wing 1, Newark Center campus at 39399 Cherry Street, Newark, CA 94560. A one-day Daily Parking Permit must be purchased. On the Newark campus, parking permit vending machines in Parking Lots B, C and D accept cash (coins and $1 bills) and credit or ATM cards. 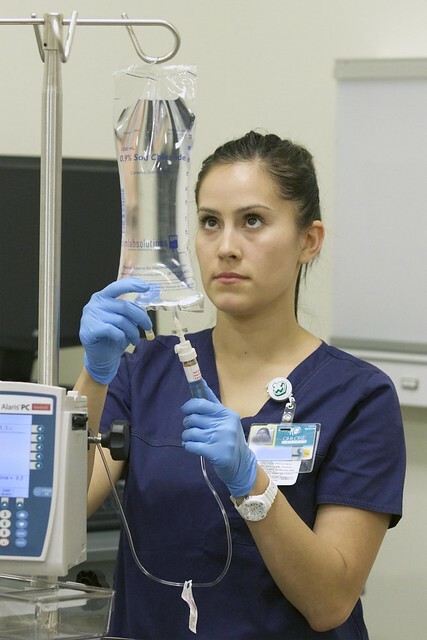 Ohlone College offers a Registered Nurse Associate in Science degree. Students who successfully complete the Registered Nursing Program are eligible for the Associate in Science (AS) degree, and qualify to take the National Council Licensure Examination for registered nurses (NCLEX-RN) which leads to licensure as a registered nurse (RN). The Ohlone College Registered Nursing Program is approved by the California Board of Registered Nursing and is accredited by the Accreditation Commission for Education in Nursing (ACEN). The Registered Nursing Program can be completed in two academic years. The graduates of an Associate's Degree program in nursing are prepared to practice as staff nurses providing direct patient care in hospitals and long-term care facilities, clinics, and other agencies where nursing roles and services are structured and well developed. All classes are held on the Newark Center campus. Clinical, hospital, and community experiences are provided at a number of sites in Alameda, Santa Clara, and Contra Costa counties. During the first year, nursing students take basic nursing and support courses to the major. The development of critical thinking, professional oral and written communications, and ethical practice form the foundation for success in future nursing courses. The Registered Nursing Program is limited in the number of students it can admit each year. Class selection is determined using a multi-criteria screening process in accordance with California Education Code 78261 and the California Community College Chancellor's Office. Points are awarded in the areas of: academic performance; work or volunteer experience; foreign language skills; life experiences; special circumstances; and a diagnostic assessment test. Program admission is offered to the highest scoring eligible applicants to fill available seats. There is no wait list for the RN program. Applicants not admitted to the program must reapply in a future application cycle. The Registered Nursing Program strongly believes in academic honesty and will exercise the department's rights when students are found cheating. Read Ohlone College's Academic Honesty Procedure. Let us hear from you! If you would like to contribute to this website, please feel free to contact Carrie Dameron at CDameron@ohlone.edu.